Who's Killing the Plug-In Hybrid? The same state agency that drove the electric car off a cliff is now poised to wreck a new Berkeley company that triples the gas mileage of a Toyota Prius. Paul Guzyk and Daniel Sherwood say their company won't be able to comply with proposed new state regulations. This article won second place for business reporting at the East Bay Press Club's Excellence in Print Journalism Contest in 2010. Daniel Sherwood and Paul Guzyk never dreamed they would be accused of harming the planet. After all, the primary goal of their Berkeley startup company, 3Prong Power, is to curb greenhouse gas emissions. They convert Toyota Prius hybrids into mostly electric vehicles that get 100 to 150 miles per gallon. But a powerful state agency is poised to put 3Prong Power out of business and deal a severe blow to a promising new industry. Next week, the California Air Resources Board is expected to adopt strict new regulations based on the theory that the innovative technology sold by 3Prong Power and other companies may be bad for the environment. Sherwood and Guzyk say that if the board adopts the new rules at its January 22 and 23 meeting, it likely will force them to shutter their business, which just had its grand opening last month at Green Motors on San Pablo Avenue. In addition, proponents of the nascent plug-in hybrid industry say the air resources board also may snuff out a key component of what environmentalists believe will be the next generation of eco-friendly cars, thereby hampering our ability to wean ourselves from foreign oil, avoid petroleum wars in the Middle East, and slow the potentially devastating effects of global warming. "It's simply too early for government regulation of plug-in hybrids," said Felix Kramer, a leader of CalCars.org, a Palo Alto-based nonprofit that has led the fight for plug-in vehicles. "Acting too soon will shut off innovation and will kill companies that are just getting started." Air resources board employees say the new regulations are not designed to squelch technological breakthroughs or bankrupt new businesses. They say they are merely trying to protect consumers' rights and ensure that the new technology doesn't roll back their attempts to limit cancer-causing emissions. After all, the board's main function is to regulate smog — not greenhouse gases such as carbon dioxide. Indeed, the story of the board's attempt to regulate plug-in hybrids has turned out to be a battle between an agency whose primary mission is to protect Californians from breathing unhealthy air and a group of environmentalists and engineers who are fighting to slow global warming. The new proposed rules also appear to contradict the board's own recent attempts to curtail greenhouse gas emissions in the wake of a groundbreaking global warming law signed by the governor in 2006. And even though the air resources board appears to have some valid concerns about plug-in-hybrid technology, to date it has acted more like an uncompromising bureaucratic agency than a trendsetter committed to saving the earth. In fact, it represents a classic case of not being able to see the forest for the trees. 3Prong Power and similar small companies that have cropped up around California over the past year are threatened by two sets of new regulations proposed by the staff of the air resources agency, also known as CARB. First, the board's staff wants to force the new startups to put their technology through a series of rigorous and expensive smog tests that could cost between $20,000 and $125,000, depending on how many cars the agency decides must be examined. 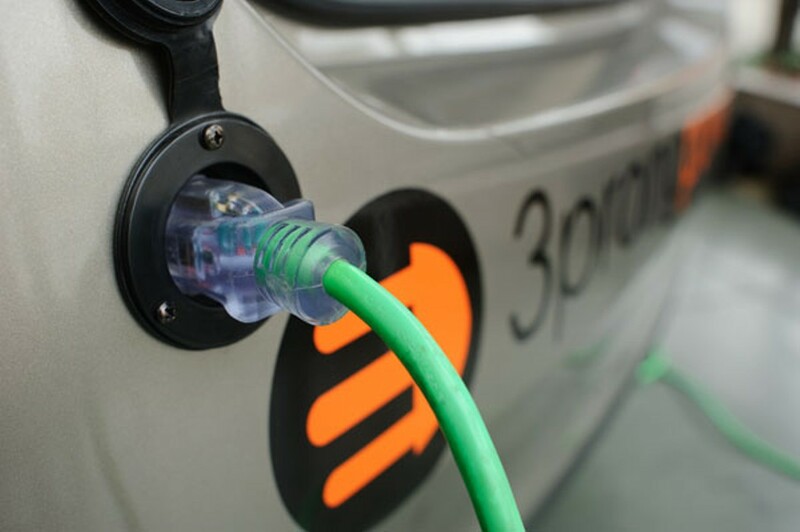 The board's staff also wants to require the new companies to provide consumers with warranties for the changes they make to hybrids for up to ten years or 150,000 miles. But the tests are too costly for the typical small startup to afford and the warranties are unattainable because the electric batteries currently used to power plug-ins don't last ten years. "For California to be on the cutting edge of green-tech, they need to be more of an enabler than a restrictor," Guzyk said. "For us, the new regulations, especially the warranty, are a deal breaker." 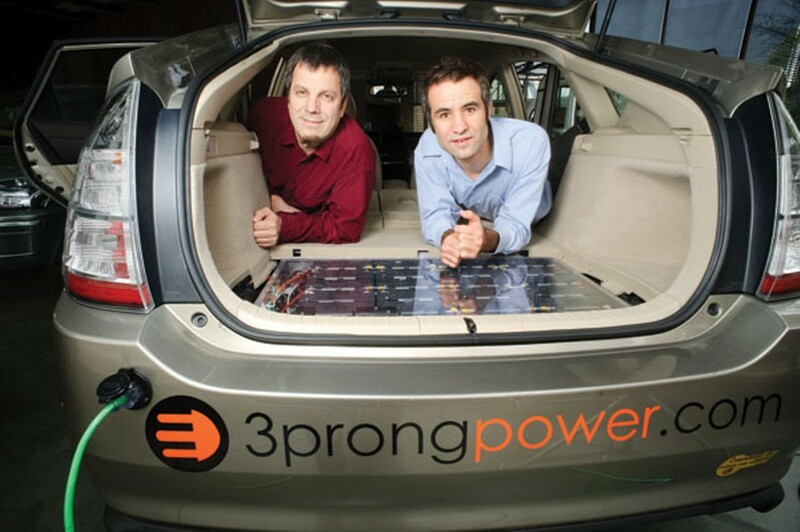 3Prong Power and its competitors transform Priuses into plug-in vehicles by putting a large flat battery in the trunk. The battery can be recharged by plugging the car into any electrical socket and allows the Prius to run entirely on electricity for speeds up to 34 miles per hour. Going faster than that triggers the car's gasoline-powered engine, transforming the vehicle back into a traditional hybrid. The conversion can double or even triple fuel economy, thereby severely limiting carbon dioxide emissions. CO2 from cars does not contribute to smog and is not harmful to human health but it is one of the leading contributors to global warming. State Assemblywoman Nancy Skinner of Berkeley, an environmentalist and a Prius owner, said she understands the air resources board's concerns about smog. But she believes the agency needs to balance the regulation of smog and of greenhouse gases and should attempt to reach a compromise that will keep 3Prong Power and other small startups from going belly up. "I'm hopeful that CARB will meet with the companies and really try to partner with them," said Skinner, who attended 3Prong Power's grand opening in December and wants to convert her Prius to a plug-in. "These are small companies. They are innovators. There must be a way to share the burden."